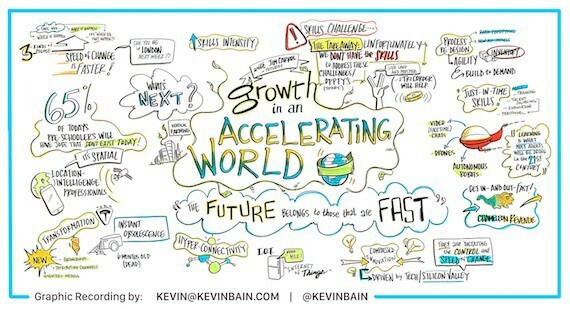 Report on a Keynote – A Fabulous Graphic Summary! Home > Blog > Report on a Keynote – A Fabulous Graphic Summary! The other day, I did a talk for a small group of senior HR representatives for a variety of Fortune 500 companies — including Owens Corning, Whirlpool, Eli Lilly, Goodyear, Proctor & Gamble, AT&T, Raytheon, Boeing and more. My focus was on the future trends that are reshaping business — and what this would mean in terms of high performance leadership. My insight was captured by Kevin Bain — who, when he is not facilitating sessions, does a fabulous job in capturing the insight of others. Here’s his summary of my talk — click on it for a super hi-res version of the file.